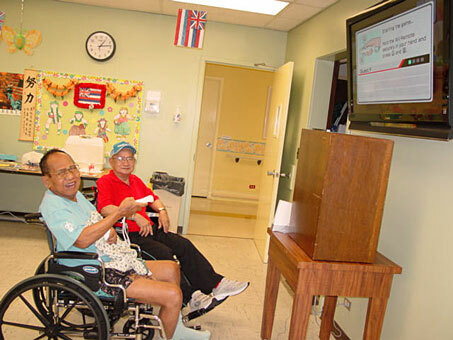 Honolulu, Hawaii — Maluhia received a donation of two Nintendo Wii gaming systems from the Injury Board. The video components provide live motion play to offer participants a fun and less painful exercise and mind-stimulation option. “Our goal in this time of economic recession is to reach out to facilities like Maluhia and help them provide the care that budget realities might otherwise prevent,” said Wayne Parsons, InjuryBoard chair. “We are delighted to have such a generous donation supporting the recovery of those in need. The advantage of the Wii is that it can stimulate functional-based exercise, which helps our patients and participants to regain and maintain their physical and cognitive skills. Additionally, the unique Wii controls allow staff to engage every participant to also enjoy past-time interests, such as bowling, tennis, baseball, etc. The InjuryBoard consists of 53 law firms from 25 states who band together to make donations to rehabilitation centers, nursing homes, and hospitals all over America. The firms are all members of a consumer safety community. The law firm of Wayne Parsons is the Hawaii member. Maluhia is one of 12 facilities operated by the Hawaii Health Systems Corporation. Established in 1996, HHSC is a public benefit corporation of the state of Hawaii. As the state’s community-hospital system, HHSC continues to fulfill the state’s promise to provide quality, hometown healthcare.